The court ruled that the Temer administration failed to justify a legitimate claim for the executive order. 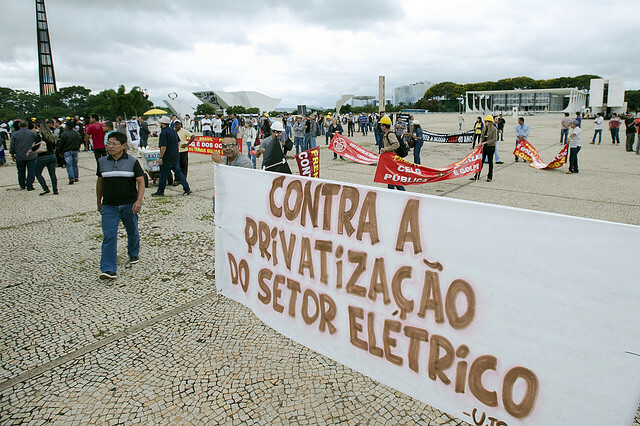 A Brazilian federal judge issued a ruling on Friday, which blocked a presidential decree that aimed to privatize the country’s state-owned electricity company. In his ruling, Judge Cláudio Kitner argued that the measure, known as MP (portuguese for "provisional measure") 814/2017, represents a direct attack on Brazilian public assets. Claudio went on to add that the Michel Temer administration failed to justify a legitimate claim for bypassing the federal congress first. Brazilian law only allows presidential decrees, the equivalent of Executive Orders, in cases of extreme emergency. In response to the ruling, the government has said that it will appeal the decision. “Politically speaking, we are convinced that the proposed privatization of Eletrobras is rooted in business interests. Our country currently does not face a domestic electricity crisis that would justify this kind of measure,” Ikaro Chaves of the Urban Services Workers Union of Brasilia stated. Eletrobras is the largest electricity utility company in Latin America and the tenth biggest in the world. Through its subsidiaries, it owns 40 percent of Brazil's generation capacity, most of it from hydroelectric power plants, and it controls 69 percent of the country's electricity distribution. Critics of the proposed privatization attempts warn that electricity costs could increase if control is handed over to private corporations. Under the proposed privation scheme, Chaves estimates that energy prices would increase by 17%. Opponents of privatizing government services argue that it disempowers citizens and voters ability to hold elected officials accountable. Moving forward, Chaves stated that civil society groups would seek to take advantage of the politically sensitive electoral year by intensifying pressure on Brazilian lawmakers. Meanwhile, Brazilian legislators that oppose the proposed privatization plan have submitted a legal measure that would force Congress to vote on bill that would require a public referendum be held in the event that the privatization plan is approved. "As soon as the Brazilian congress is back in session, we we will appeal to Rodrigo Maia (DEM-RJ) [the speaker of the House] so that our referendum proposal can be debated in the House," Congressman Danilo Cabral (PSB-PE) stated.